When your favorite pattern company – Papercut – and one of the best fabric shops in the world – The Fabric Store – organize a competition, the only thing to do is of course enter it! The subject of the contest is the Skipper Tunic, a very versatile pattern which “comes with 3 sleeve length options, 3 neckline variations and 3 garment lengths. 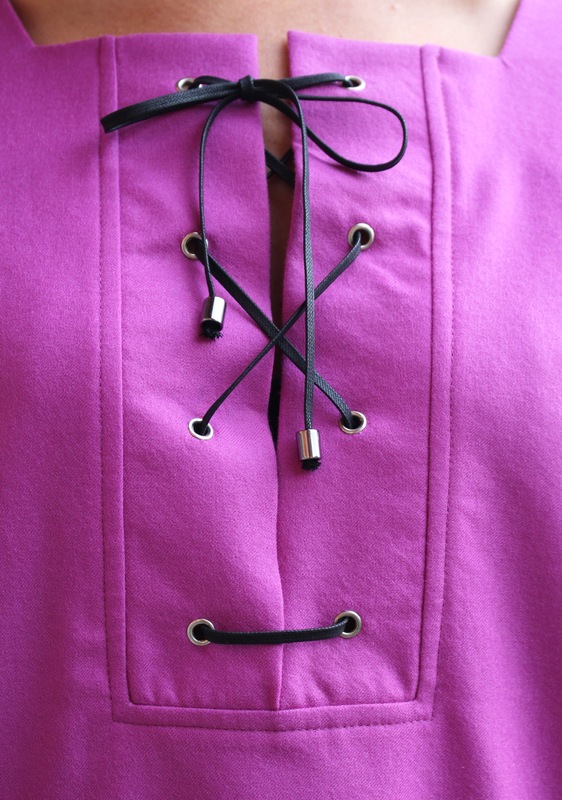 This relax-fit garment can be cropped, hip or tunic length with a square neck, deep v-placket or lace up front options”. As here in the northern hemisphere we are moving towards winter, I’ve decided to make the tunic, with 3/4 sleeves and the lacing at the front. I’ve thought about personalizing the pattern with some fun details – like bell sleeves, for example – but in the end I’ve kept things simple and concentrated my attention on fabulous fabrics and sewing techniques instead. And what a better fabric to chose if not a super soft wool flannel bought nonetheless at The Fabric Store in Brisbane?! I simply had to use this fabric for this project, it was a match made in heaven. Also using a wool material seamed the only reasonable choice for winterizing such a fresh and summery-looking pattern and the plain color helped showcasing the lovely neckline details. When less is more, for once! For comfort and warmth, I’ve fully lined the dress with an equally amazing fabric, a microfiber and elastane blend, with a wonderful drape, a squishy hand and just a little elasticity, perfect for wearing it next to skin. The color is nearly the replica of the shell fabric and I was extremely happy when I finally found it in a little shop in Pistoia, a town nearby. The price wasn’t exactly cheap, but the quality is excellent and the result certainly made up for it. Working with such good quality fabrics made the sewing a real pleasure. The wool flannel was extremely malleable and I had no problems setting the sleeves in – like no puckers at all at the first go! – and I just love how the stitches sunk into the material, nearly disappearing. On top of that, this fabric presses very well, which resulted in nice and smooth neck plackets, sleeve facings and hem. Adding a lining was pretty easy: I’ve just removed the facing pieces from the front and back and added 2cm seam allowances, then sewn up the facings to the lining pieces and added the sleeves as done for the dress. I’ve also made some sleeves facings and I made sure to leave the lining a bit longer to account for ease of movements. 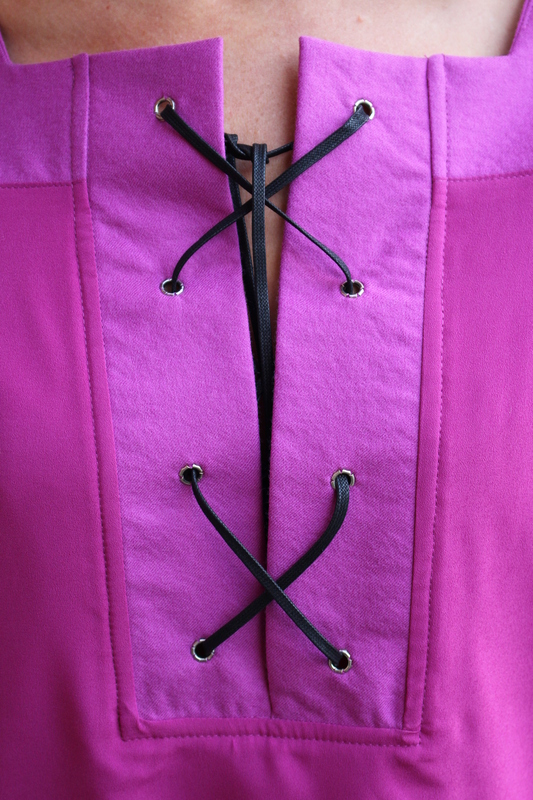 To join the lining to the neckline, I had to change slightly the construction sequence recommended by the instructions. First of all, I’ve sewn the plackets to the neckline, both as the sides and at the bottom, then I’ve joined the tunic front to the back and afterwords I’ve secured the lining to the neckline and along the plackets. The topstitching of the plackets was done at the end of course. To set the eyelets I went to the town shoe repairer, which made the job for me. I chose silver small eyelets, I think they are more winter looking than gold, and I like how the go with black, therefore black lacing. To add another touch of silver, I’ve added knot stoppers to the ends of the string. 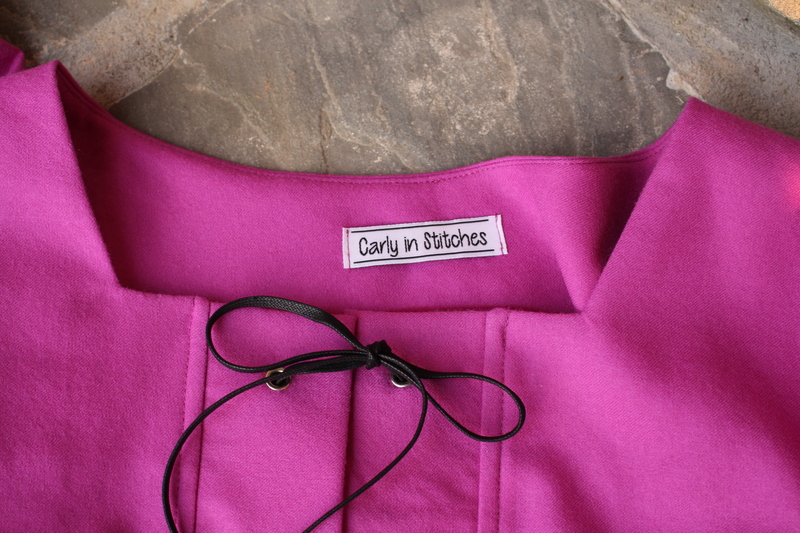 Now about the sizing and fit of the Skipper Tunic. Can you believe I had to do nearly no alterations to adjust it to my frame? I’m so happy with the pattern drafting I really should make one for every day of the week in every possible variation. I cut a size S for the shoulders and neckline, at the underarm I traced in between S and XS and under the bust I blended my middle size to the XS to the hem. I’ve done a 3/8″ FBA and 1/2″ sway back adjustment as the front was rising a bit and the back was a tad too long. The shoulders and sleeves fit was right straight out of the envelope and this is pretty amazing for me, as I usually have to fuss a lot in this area, that’s why I’m so impressed with this dress. Finally I’ve raised the bust dart by 1/2″ and that’s it. I’m very happy with this tunic – the pattern is easy but with plenty of different options and lovely details, the fabrics I used are divine and I really enjoyed the sewing, which resulted in a pretty well made garment, if I may say so myself! I love this dress, that’s it! This dress is just lovely. I’m always inspired by your makes and I ALWAYS love your color choices. Thank you for sharing! Thank you Natalie, I’m very happy you like the my makes, I really do my best when sewing and it’s always nice to receive compliments! Beautiful both the dress and the model, in bocca al lupo for the contest ! Thank you Ingrid, and CREPI IL LUPO!!!!!! It is a cute pattern. You’ve chosen a lovely colour for it. Nice work with the alterations! Thank you Linda! This fabric has been in my stash for over a year and it looked perfect for this project, it has a nice drape and it’s super soft too! What a great dress!! It looks so good on you. I think you found the perfect fabric to winterize this dress and still make it a fun one. You’ve done marvelous job on lining it! I am so impressed and will try to replicate it in the future :) Good luck in the competition! Thanks Anya! Adding the lining was quite simple, the hardest bit was securing the lining to the neck opening, but apart from that the dress went together very quickly and smoothly! Can’t wait to see yours! That’s a great dress, and you’ve done a fabulous job picking a great fabric color and i love the tie closure. Good luck in the contest! Thanks! I really like this pink lilac and I’m sure it will brighten up those rainy autumn days ahead!